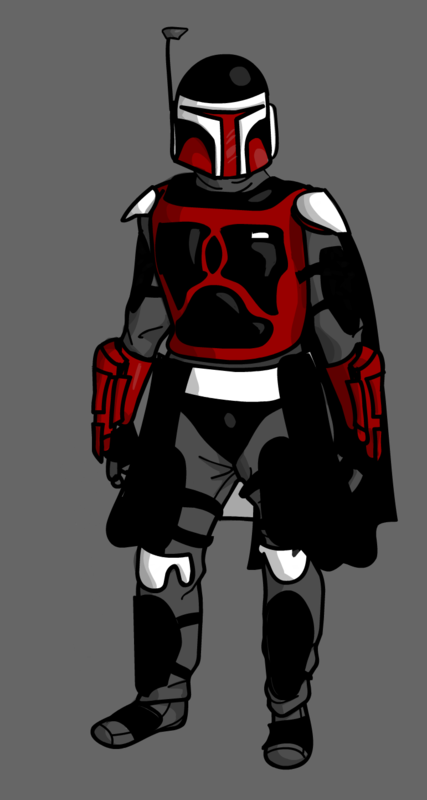 Added my favorite color scheme to mandomaker, doing modern era medium-class armor. I'm kinda amateurish with color, so lmk if you think I'm overdoing any of the colors or if they're too bold. Pure black and red is a bit of an eyesore, to be honest, and gives off a bit of an "I'm so edgy and dark" feel. If you're going to stick with that color scheme, then I recommend adding some more color, even if it's just a few splashes of grey here and there or a white racing stripe on the helmet. Hand me my thinking grenades. Personally, I am not a big fan of singular "signal" colors since it does come off as too bold and too bright on the eyes with nothing to break up the monotony, even with the black flightsuit. It has a weird...floating to it and the stark red feels too...I don't have a specific word for it aside from an onomatopoeia like "ow". However, if the color appeals to you go for it. The helmet looks good since the red isn't the dominant color. What is important is how your kit is "you" and what you want it to be. If you are looking for another eye as a suggestion: if you want to keep the scheme, I would say add in a secondary color that helps mute the red. 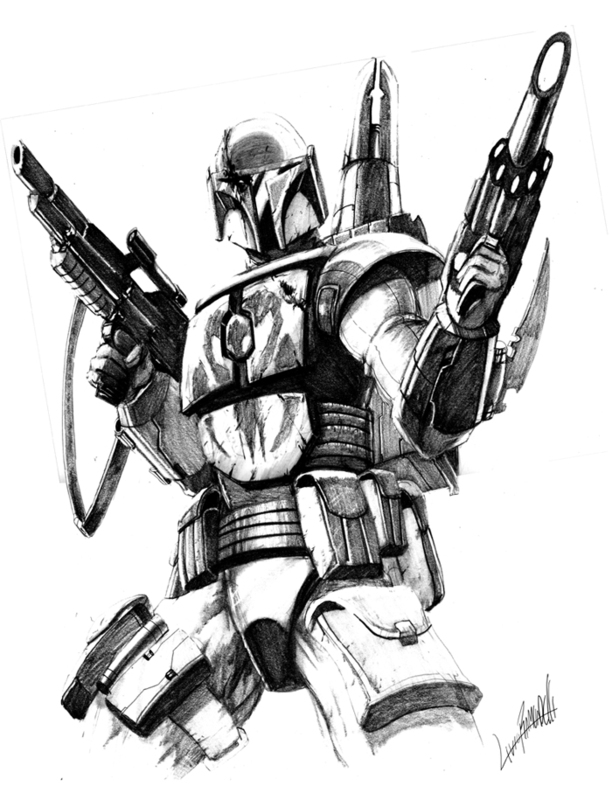 Something like a warm white and maybe a cool dark grey flak vest. With weathering , it can help mute the bright "OMG RED". I'd also say a trim to the black Kama (red trim or something) to help it stand out a bit more, too. Right now, it just looks like a void lost in a sea of red. 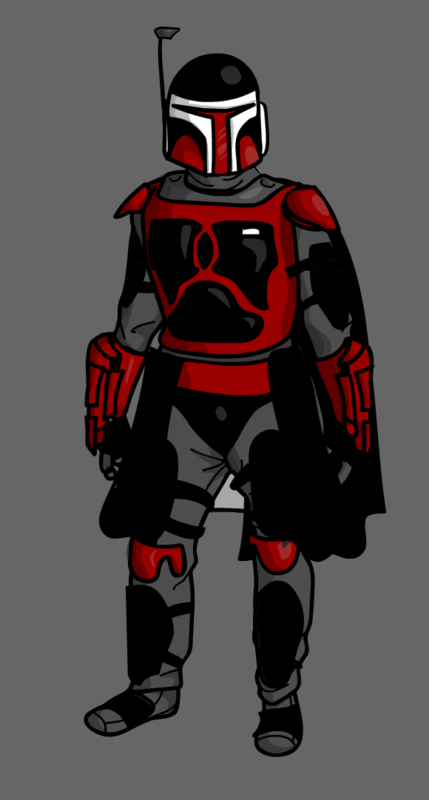 I'd also avoid red for the girth belt and maybe cool dark grey. There are a lot of warm colors on your scheme and it needs to "chill out"....so to speak. As jag and frostfyre have said, the most important thing is that it's what you want it to be. that being said, just black and red are an extreme contrast. in my opinion, it helps to look at your soft parts as one thing, and then your armor as another thing. for instance, if your flight suit is black, having a vest that's a little lighter, like a gray or white, makes it pop a lot more. then once you put your armor on, you may find that just one color over all of it can be a bit much, so you might consider an accent color. i suggest looking up a color wheel and picking something that complements nicely. maybe add some stripes or designs throughout your kit. Thanks for the pointers, I'm going back to the drawing board with this in mind. I'm probably gonna replace a bunch of the blacks with grey and use white as a tertiary color. One thing I see is with the helmet is that the visor will be hard to make it out it making the area around the visor a grey with give the visor more of a pop to it so its not lost in the sea of red. So I updated the design, and came up with 3 more mock-ups. 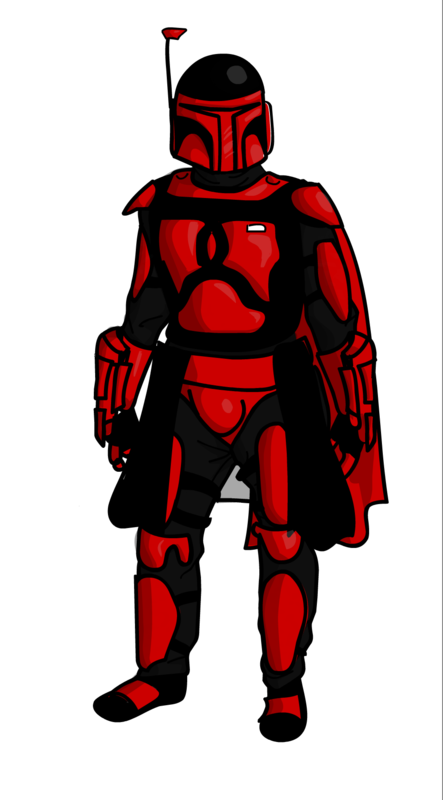 I made the reds darker and added some more black to make the getup less of an eyesore. I also added some whites to complement the darker colors. I'm also planning on adding a red fringe to the half cape and kama along with the armor pieces so it isn't completely dominated by black. Feel free to pick at it, I really appreciate the criticism. These are very much a step in the right direction and any would be a solid choice. I tend to lean towards the second design a little, only because it feels the most balanced, but again, these are all great concepts. I changed the collar piece later on, initially I made it grey but I'd consider that one to be black as well looking back at it.